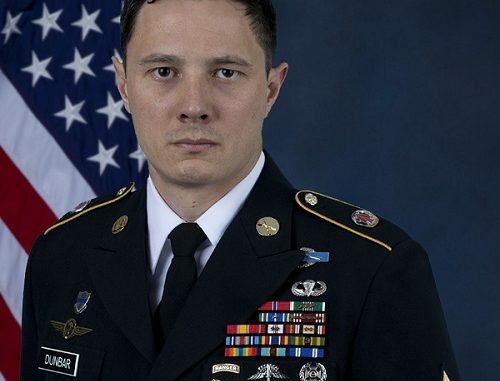 MSG Dunbar – US Casualty in Syria – On March 30, 2018, MSG Jonathan J. Dunbar died from wounds received during combat operations near Manbij, Syria. A United Kingdom member of the Parachute Regiment also died. Five others were wounded and were evacuated for medical treatment. MSG Dunbar, age 36, of Austin, Texas, was assigned to U.S. Army Special Operations Command, Fort Bragg, North Carolina. He was deployed in support of Operation Inherent Resolve. He was born July 15, 1981, in International Falls, Minnesota, and graduated in 1999 from John B. Connally High School in Austin, Texas. MSG Dunbar first entered the United States Army as an Infantryman in May 2005, completing his initial entry training at Fort Benning, Georgia. His first assignment was with Charlie Company, 1st Battalion, 325th Airborne Infantry Regiment, Fort Bragg, North Carolina, where he served as a Machine Gunner, Fire Team Leader, and Squad Leader. During his time with the 325th he deployed once to Afghanistan and once to Iraq in support of combat operations. In November of 2009, he transitioned to Charlie Company, 2nd Battalion, 38th Cavalry Regiment (Long Range Surveillance), Fort Hood, Texas, where he served for four years as a Squad Leader. During his time in Fort Hood, he deployed to Iraq once again in support of combat operations. In 2013, MSG Dunbar was assigned to Headquarters, United States Special Operations Command, where he served as a Team Member and deployed three times in support of combat operations in Iraq and Afghanistan. Dunbar’s military education includes the Basic Airborne Course, Combat Lifesaver Course, Basic Leader Course, Ranger School, Advanced Leaders Course, Pathfinder Course, Static Line Jumpmaster Course, Advanced Land Navigation Course, Senior Leaders Course, the Survival, Evasion, Resistance and Escape (SERE) Course, the Military Free Fall and Jumpmaster Course, and the Special Forces Sniper Course. UK Casualty. The UK casualty was a member of The Parachute Regiment. He has been identified as Sergeant Tonroe of the 3rd Battalion, of the Parachute Regiment. He was embedded with US forces on a counter-Daesh operation when the incident occurred. There are some UK media reports saying Sergeant Tonroe was a member of the Special Air Service (SAS). Incident location. Initial reports say the IED strike took place in or near Manbij, Syria. This area is in northern Syria not far from the Turkish border along the M4 highway between Aleppo to the west and and Kobane to the northeast. It is in the northeast of the Aleppo Governorate. The area of Manbij is ethnically diverse including Arabs, Kurds, Circassians, and Chechens. The M4 highway runs east – west just south of the Turkish border. A Contested City. 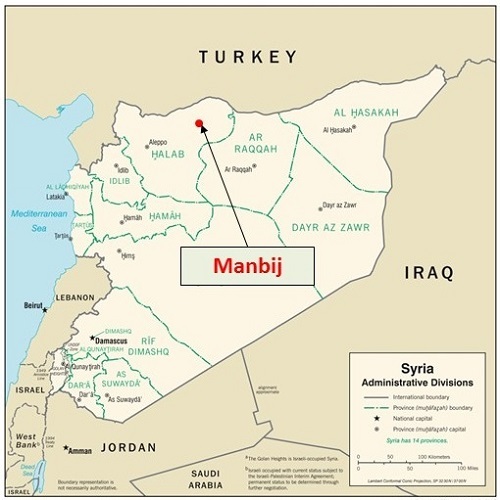 In 2012 Manbij was taken by Syrian rebels. In 2014 Islamic State fighters took control of city. After a Kurdish offensive, Manbij has been a Kurdish-held area – controlled by the YPG/SDF since mid-summer 2016. Since 2017 there has been a Coalition presence and the city has been a hub for the training of Syrian Democratic Front (SDF) fighters. Sergeant Matt Tonroe Killed in action in the Middle East, British Army, March 31, 2018. DoD Identifies Army Casualty, DoD, March 31, 2018. Death of Coalition Personnel, CENTCOM, March 30, 2018. US and British soldiers killed in Syria were on ISIS ‘kill or capture’ mission, CNN.com, April 2, 2018. UK Special Forces soldier killed in Syria bomb blast, Sky News, March 30, 2018. Syria bomb kills 2 coalition troops from US and UK, The Fayetteville Observer, March 30, 2018. Coalition Casualties Syria – March 29, 2018, SOF News, March 30. US Steps Up Protection for Coalition Forces in Northern Syria’s Manbij, Voice of America, March 30, 2018. Editor Note: Some information has been updated as new reports about the incident have come to light.